Okay, I’ll be up front and admit Street Sharks wasn’t exactly the vanguard of the women’s rights movement. That said, here’s what I managed to scrape together to show that Street Sharks was a feminist show years ahead of its time. Here we go. Lena Mack is a student of the Street Sharks’ arch nemesis, Dr. Luther Paradigm. She sees through Paradigm’s benign facade and teams up with the Street Sharks. Now, not only is Lena a woman, but she is also black, so I’m going to go ahead and say she represents resistance to both patriarchal and racial power structures. Great. One down. Hope that one did something for you, because fair warning, it’s pretty slim pickings from here on out. Surrounded (and employed) by corrupt, incompetent men, Lena is—arguably, like many women in the real world—on her own. Indeed, she’s the only female character on the entire show. To stand by one’s values in such a situation takes true courage. If this already sounds like a rehash of the first one, you’re going to have to live with it. This is just what we’re working with here. Okay, here’s the deal: If we’re going to make it past three or four items on this list, I need you to take a bit of a leap of faith and accept the premise that the Street Sharks themselves symbolize the modern feminist movement. They are a marginalized minority under constant attack from the establishment as embodied by a man named, fittingly, Dr. Paradigm. And that’s the best I could come up with. Take it or leave it. Let’s keep plugging along. Consider the pilot episode, “Sharkbait,” in which Dr. Paradigm’s gene-slamming procedure transforms four brothers into mutants, who manage to escape his clutches. Immediately, Paradigm decries the mutants and pursues a public fearmongering smear campaign against the Street Sharks, forcing them into hiding. Is there any more apt and concise encapsulation of the chauvinistic impulse to use shame as a weapon? Probably, but not on this list. In the second episode, “Sharkbite,” Dr. Paradigm himself is gene-slammed with a piranha to become the mutant Dr. Piranoid. Although he is now a mutant just like the sharks, he continues assassinating their character, calling for them to be imprisoned. With some substantial mental gymnastics, this is a scathing critique of our sexist society. Make of it what you will. In the Street Sharks episode “To Shark Or Not To Shark,” Dr. Piranoid tries to defeat the Street Sharks by making them human again. Unable to defeat the Street Sharks on their own terms, he tries to take away the very DNA that made them Street Sharks in the first place. Perhaps you can see how, in a way, that’s like trying to extinguish feminism by destroying femininity itself. If you really, really squint, you can sort of make out something resembling a feminist message here. 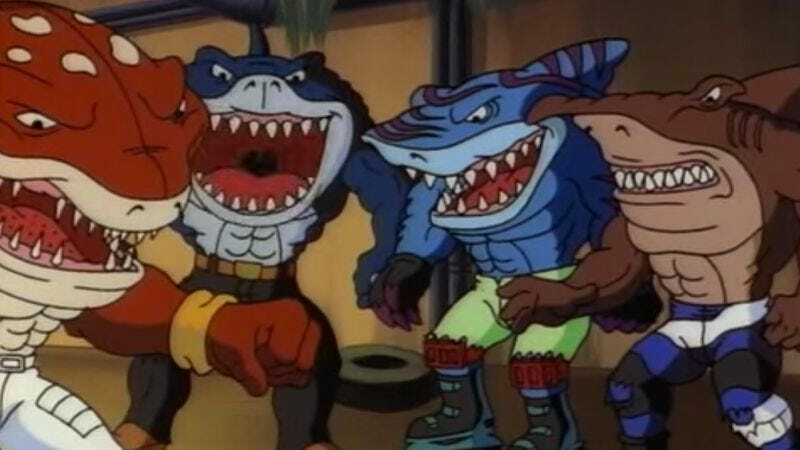 Let’s take a glance at the names of just a few of the villains in Street Sharks: Killamari, Clammando, Tentakill, Slash. Do these overtly bellicose names speak for themselves, revealing a radical feminism at the core of Street Sharks? I goddamn hope so, because at this point I am totally running on fumes. All right, we’re limping toward the finish line here. Just bear with me on this one. Cosmetic surgery is often seen as a way for women to conform to cultural standards of femininity, but perhaps it can be the reverse: a positive assertion of identity, a source of empowerment. By depicting a gang of superhero sharks whose powers derive from whole-body-altering procedures, Street Sharks… addresses this issue somehow. Sure. Half shark. Half man. Fighting evil, that’s the plan. They bite. They fight. They stand for everything right. They bite. They fight. Chewing up evil with all of their might. Wow. What a stunningly direct piece of writing that we might as well say contains the deceptively simple mantra that guided Street Sharks’ covert feminist agenda at a time when most TV shows wouldn’t touch the subject. A true testament to how progressive Street Sharks was. And that’s all I got.